why is CoolBoard balance board the ultimate balance trainer? 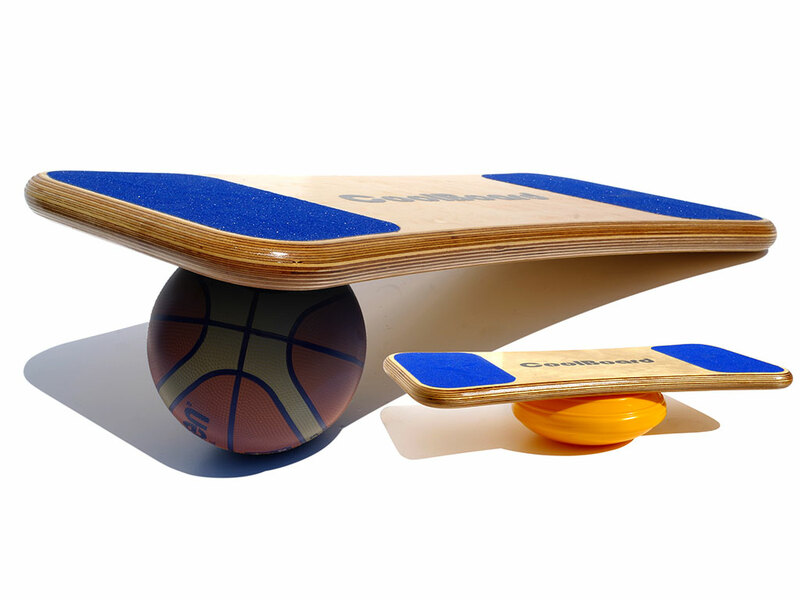 CoolBoard is the worlds best balance board, wobble board, and core exerciser, period. Since hatching a simple, progressive and highly effective idea – CoolBoard – We have spent the last 10 years developing and perfecting the worlds best balance board so everyone can benefit. One product with so many benefits and uses. We also pride ourselves on being friendly, decent and very helpful! Time to get on the Ball! 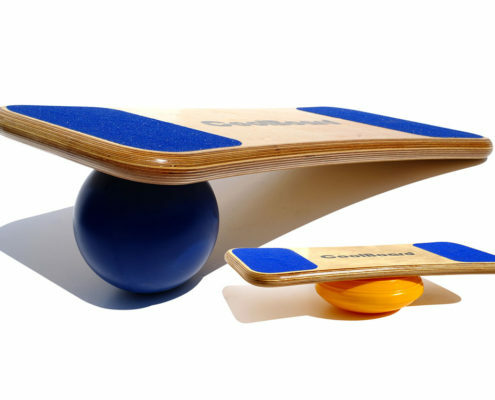 CoolBoard balance board overcomes the limitations of other balance trainers to unlock the full potential of balance training by balancing on a ball. We use our Disc to give an easy start. When balancing on a ball CoolBoard can rock and roll, or to put it another way – slide and tilt – in any direction – giving more movement than any other balance trainer. Other balance trainers suffer limited movement in one way or another – see balance board comparison below – CoolBoard does not, and our unique movement is patent protected. Most people find getting the hang of it takes using it a couple of times a day for 5 – 10 minutes over 2 to 5 days. Once you do get the hang of CoolBoard balance board it is always fun and addictive to get back on. This means you will use it more for longer, giving you far more benefits. CoolBoard helps a very diverse range of needs, from wheelchair users to professional athletes. CoolBoard can be used seated, standing and for over 70 exercises and stretches. By offering a range of boards, balls and discs the movement of CoolBoard balance board can be tailored to your current level while allowing you to progress into the future – balance training for life. Ball – Giving our full unique movement. Available in Slow, Standard and Quickness speeds and 3 sizes. Disc – The movement is dampened to a rock or tilt in any direction – just the same as a wobble board, but with an adjustable amount of tilt achieved by altering the inflation of the disc. Boards – The bigger the board, the more movement – so smaller is easier, and larger is more challenging. This selection allows you to progress from ‘barely able to walk’ to ‘Olympian’. The full movement of CoolBoard adds many benefits to your balance training. Most actions in life, walking & running, doing a board sport, and chopping down trees, do not happen in one plane of movement, they use many planes of movement all at once in one movement. By being fully free to move, training on a CoolBoard allows your body, mind and proprioception to prepare itself for the complex movement patterns of everyday life and sport. This extra movement means that more of your muscles, tendons and ligaments or worked in more planes, thus all physical benefits are greatly increased. The same applies to your brain and your proprioception. This makes CoolBoard one of the most effective trainers you will find. 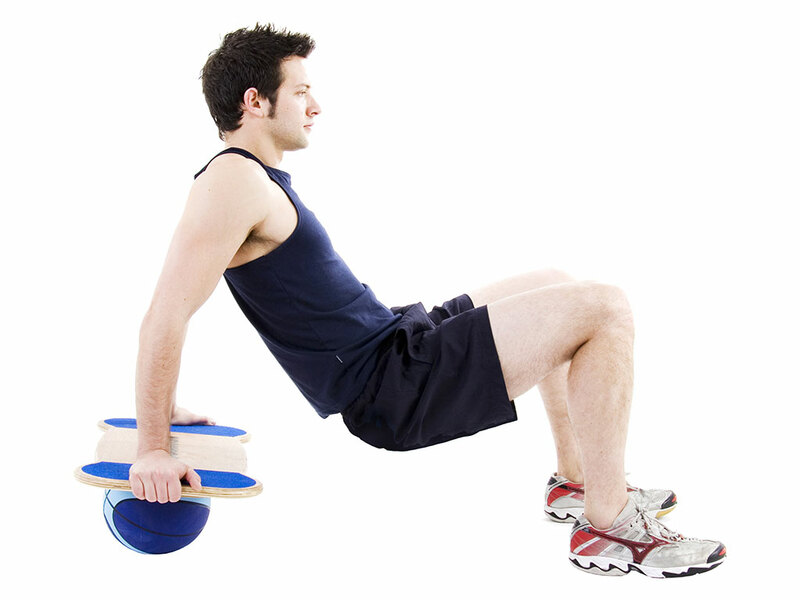 The added benefit of this movement is that it is fun, addictive and constantly challenging. This means you are far less likely to tire of your workouts. In fact you will find you keep coming back for more, day after day, and year after year. It means that using your CoolBoard is a pleasure, a fun activity in its own right. Physiotherapists love this aspect for CoolBoard as the key to good recovery is frequent and regular use, and many people tire of their traditional recovery workouts quickly – enter CoolBoard! These can only rock or tilt in one direction and offer no roll or slide. These are very easy to get the hang of and get boring very quickly. Good for very early rehabilitation. These provide the cheapest balance training options but are very limited. Good for very early stage rehabilitation. Generally only big enough for one foot and provide some tilt on an unstable surface. People are often put off by the lack of a surface. As found in most physiotherapists. These can rock or tilt in all directions. But they cannot roll or slide at all. Most have a very close stance. These are very easy to get the hang of and get boring very quickly – a physio’s nightmare. 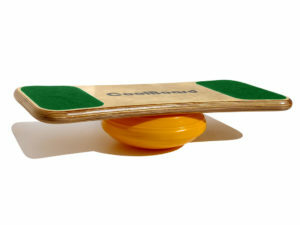 By using CoolBoard with our Easy Start Balance Disc it becomes the best wobble board. You get the good stance and solid platform for CoolBoard combined with the adjustability for the inflatable Disc. The 40 cm Disc is more stable while the 30 cm give a more nimble movement. Basically a large disc or half gym ball attached to a surface. Provides similar movement to a wobble board with a bigger platform and more versatility. We believe CoolBoard on a Disc is better and more versatile. There can rock or tilt in one direction, and can roll or slide in the same direction. These are fairly easy to get the hang of and get boring fairly quickly. Some manufacturers use a roller that is conical at the ends. This gives a degree of tilt in the toe – heel direction, but still no slide or roll. Some models can be used on a Disc as a wobble board. CoolBoard on the ball gives full movement – rock or tilt, and roll or slide in all directions. It takes a bit of practice to get the hang of as you learn and your body develops – which is good for you. CoolBoard can be used on a Disc as a wobble board. Most people find getting the hang of it takes using it a couple of times a day for 5 – 10 minutes over 2 to 5 days. Once you do get the hang of CoolBoard it is always fun and addictive to get back on. This means it will get far more use for far longer, giving you far more benefits. Cleverly shaped ring provides your safety bump stop – the most important difference between the sizes. 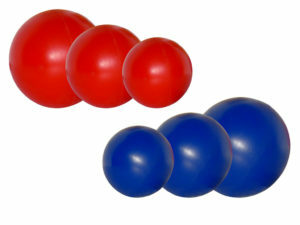 ProBalls – 3 sizes and 3 speeds, a Ball for everyone. Our ProBalls are made uniquely for us, expensive to develop and produce, but well worth it! 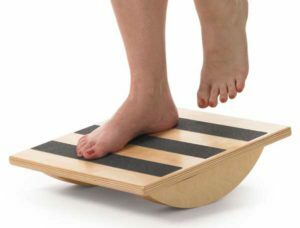 CoolBoard provides a rock solid platform which gives the perfect footing for your balance training. Unlike many other balance boards, CoolBoard will support your entire foot, and allow you to adopt and natural stance. Our cleverly shaped ring on the underside limits the movement when you are using a Ball, providing you with safety by stopping the board from rolling right off. 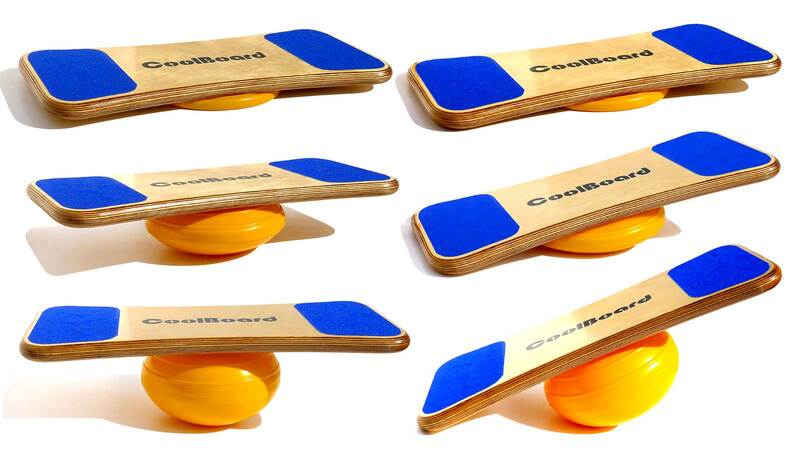 To maximise this movement CoolBoard balance board comes in two sizes chosen by shoe size. CoolBoard is made to a very high standard by hand in Bristol, UK. CoolBoard is machined from high quality birch ply. It is finished in 4 layers of durable varnish so that it will keep its good looks for many years of use. CoolBoard is designed to be a pleasure to own as well as extremely functional. All materials are environmentally friendly wherever possible. Our Inflatable Balls are supplied by Molten, who own the patent for the strongest ball of this type. This means our Inflatable Balls work better and will last longer than any other inflatable ball. We specifically developed our Pro Balls in conjunction with one of the UK’s leading polyurethane manufacturer. Our Pro Balls are solid polyurethane made in a unique way meaning they will last a lifetime and most importantly will work better than any other ball. Our Discs are supplied by a leading Italian manufacturer. They are made from DINP (diisodecy phthalate) as opposed to the toxic DOP (di-2-ethyl hexyl phthalate) plasticisers. They are Latex free and will also last for many years. We have been designing, testing, using and making CoolBoard since 2006. We have patented it worldwide. We continue to develop new products, exercises and workouts to help our customers. This is often inspired by CoolBoard users finding new uses for it. We are always available and happy to help all of our customers. Since conception we have worked with physio and fitness professionals to help you to get the best form your balance training. We now have over 70 exercises and stretches enabling almost every part of the body to be worked. Most movements allow for progression to enable you to grow and improve. We have a large selection of tailor made workouts and exercise suggestions for a wide range of uses. We will continually add to this wealth of information. Why CoolBoard’s unique movement truly unleashes balance training. How CoolBoard offers more progression allowing you to progress from barely able to walk to being fitter than ever before. We explain the increased benefits of CoolBoard due to this movement and progression. We compare CoolBoard to all other balance board types to give you an honest overview of balance trainers. And finally you can read about the design and construction of CoolBoard and explain the effort and expense we put in to making sure every CoolBoard is of the highest quality and will last for many a year.